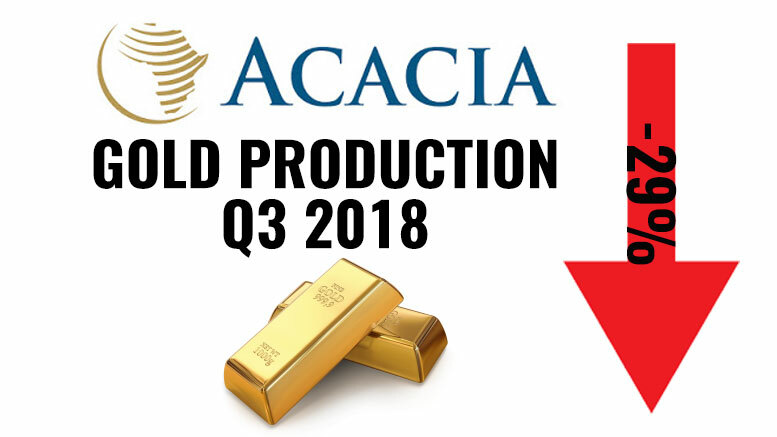 Tanzania’s gold miner Acacia Mining (LSE: ACA, DSE: ACA), has recently published its unaudited results for the 3 months ended 30 September 2018, indicating a gold production 29% lower than Q3 2017 but ahead of both Q1 2018 and Q2 2018. In Q3 2018, gold production was 136,640 ounces, compared to 120,981 ounces in Q3 2017 and 133,778 ounces in Q2 2018. In Q3 2017, Acacia took to the decision to place its Bulyanhulu gold mine on reduced operations due to the unsustainable losses experienced at the mine due to the inability to export concentrate. This process was completed in Q4 2017. However, he also showed his deep concern about the increasingly challenging operating environment in Tanzania, relating to the criminal charges of tax evasion and money laundering brought against several of its employees over the past weeks by the Tanzanian Prevention and Combating of Corruption Bureau (PCCB). Acacia is currently in a raw with the Tanzanian government after a presidential committee found in May 2017 that the company allegedly under-declared its exports and eventually presented it with a demand for USD 190 billion in unpaid taxes. The gold producer has always refuted the accusation and has been since in talks with the Government of Tanzania for a resolution. In his latest statement, Galea stated that the company will be reaching out to the Government of Tanzania to seek the opportunity for direct dialogue but also to inform it that failing a negotiated resolution, the company may need to pursue claims under the relevant bilateral investment treaty.